One of the best things about eating a plant-based diet is that you can essentially have dessert for breakfast and it's completely healthy! For example, you wouldn't often catch someone starting their day with a huge bowl of regular chocolate ice cream because it simply isn't nutritious enough to do so. 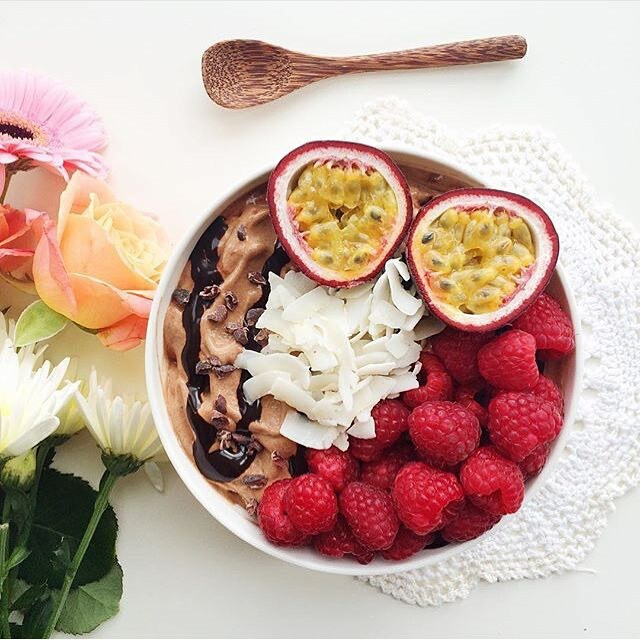 However, when it comes to chocolate banana ice cream it's a completely different story; the only ingredients in this bowl of heaven are frozen bananas, raw cacao powder and a tiny amount of water or non-dairy milk if necessary - super simple and super healthy! Plus it tastes absolutely incredible and that's the most important thing, right? Put the frozen banana chunks into your food processor then add the non-dairy milk or water (if using) and blend the bananas until they're a smooth and creamy consistency (it usually takes 8 - 10 minutes for me). You may need to stop the food processor every minute or so to make sure the motor doesn't overheat and to break the banana up a bit with a spoon to ensure it blends properly. Once it's smooth add the cacao/cocoa powder and blend again until it's incorporated, then transfer the banana ice cream into a bowl and enjoy! Hi Meghan, I always love looking at your recipes. Could you tell me what the difference is between cocoa and cocao? I've been searching but can't seem to find an understandable answer! You can seem to buy them both as 'raw'. Where do you buy your cocao powder from?